One of the things to do in Mumbai, when I moved in here in the late 1990s, was to have the Irish coffee at Juhu’s Prithvi Café. It was an integral part of the Bombay experience then. I’d ticked it off my list fairly early on in my stint in the city. I hadn’t gone back to Prithvi Café since then even though we’d dropped in to see a play or two at the Prithvi Theatre. 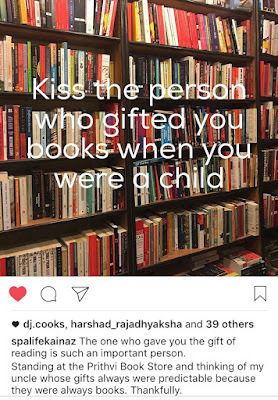 Prithvi Cafe came back in my radar recently thanks to Vernika Awal who is on social media as ‘Delectable Reveries’, which is the name of her blog and Instagram handles. Prithvi to her, it seems, is what Candies is to me. She’s been going here for the last 12 years or so. She lovingly puts up pictures of the parathas at the Prithvi Cafe every second day on Instagram and those parathas called out to me. Vernika invited K and me to join her for breakfast at Prithvi for parathas someday. That plan stayed in limbo for a while till last Sunday evening when K and I found ourselves in Juhu. I suggested checking out Prithvi to K and then messaged Vernika to see if she could join us there. We reached an hour later. I had visions of young Vernika switching from chair to chair all this while, alternately putting on a wig and a moustache, pretending to be three people at a table. After we reached the Prithvi Theatre, I realised why Vernika was so concerned. The café is located in the compound outside the theatre. There was a sea of people waiting there and it looked like the proverbial Kumbh Mela. Vernika was waiting for us at the entrance. She told us that the café was packed. She said that many of the people at the cafe were waiting to go in to watch a play. She also pointed to a row of people sitting in a queue ahead of the cafe by the entry to the theatre. "It's free seating in the theatre. Unlike those in the cafe, these people are keen to get front row seats," explained our Prithvi expert. Vernika said that we had to wait for about another 15 minutes for a table according to the reservation system app on her phone. She then suggested that we go to the book shop. I had no idea that the Prithvi Theatre had a book shop till Vernika told me about it. I wondered if it would contain books on theatre at the most or just books on Prithvi. The way a museum gift shop would. Turned out that this was not the case. The book shop was a small place. Looked similar from outside to a bookshop we had seen near San Gines, The popular chocolate and churros place in Madrid. The first book to catch my eye in the Prithvi store was a Bertie and Wooster PG Wodehouse one. Then I looked up and saw a Woody Allen omnibus. I immediately picked it up for K.
I had introduced her to Woody Allen through my copy of Side Effects when we were dating. It was my aunt's book which I had borrowed and never returned as she didn't live in Kolkata anymore. Since then K has become a huge Woody Allen fan. The Woody Allen DVDs and posters on display in our house make this amply clear. These are largely gifts from me to her. When I see anything to do with Woody Allen, I pick it up for her. Makes for a bankable gift and one which is never exchanged! Meanwhile Vernika picked up a copy of Em and the Big Hoon by Jerry Pinto. This is one of the best examples of an Indian author writing in English that I have come across in a while. The writing is so fluid. The command over the language so masterful. Vernika then spotted a copy of Alex Hailey’s Roots. K saw that too and decided to gift a copy to young Vernika just as K’s mama had gifted one to her (K) years back. I had read Roots in college when my neighbour in Kolkata, Rana da, had lent it to me. Book lovers look out for each other you see and I think we had decided to adopt Vernika by the end of the evening. Then I saw Fahrenheit 451, a book we had discussed in my Sociology days in Presidency College. K picked that up for me seeing my excitement. I saw that the shop is divided into two sections. English and Hindi. In English, I saw at least a dozen books that I wanted to pick. So different from the Crossword book shop near our house in Bandra. When I go there, I look blankly at the books on display and come back without buying anything. None of the books talk to me there while at the Prithvi bookshop every second book seemed jump at me asking me to take them home. It seemed like the personal collection of someone who loves to read. I could see that the effect was the same on K and Vernika. Managing the store was Raju who moved in to Mumbai from Darbhanga in Bihar. A cheerful young man who loves to read books. Specifically Hindi literature. Apparently he has long chats on Hindi literature with Vernika’s dad when the latter drops in at the shop. Raju strongly recommended Herman Hesse’s Siddhartha to Vernika. Another book from my aunt’s collection that I read in college. My late grandpa, who infused the love of reading in me, used to read this often in the afternoons before he fell asleep. The only time Raju didn't smile! Vernika then led us on to another secret. Next to the main shop was a small section where they sell second hand books. Not any second hand book though. The titles on display were carefully chosen by the owner and that showed in the quality of what was on offer. There is a coconut tree inside the section. Vernika told me that she often brought her own books over to sit there and read. I used to be like K and Vernika till recently when it came to books. I was a voracious reader right from my childhood days. At times I’d finish reading a book a day when I was in school. From detective stories and war thrillers of the Leon Uris and Forsythe kind to the comic relief of PG Wodehouse and Sue Townsend and the Yes Minister series to heavier stuff such as Rushdie, D H Lawrence, Somerset maughma and Iris Murdoch and what not. Ulysses is the only book that I had taken up then and couldn’t finish. 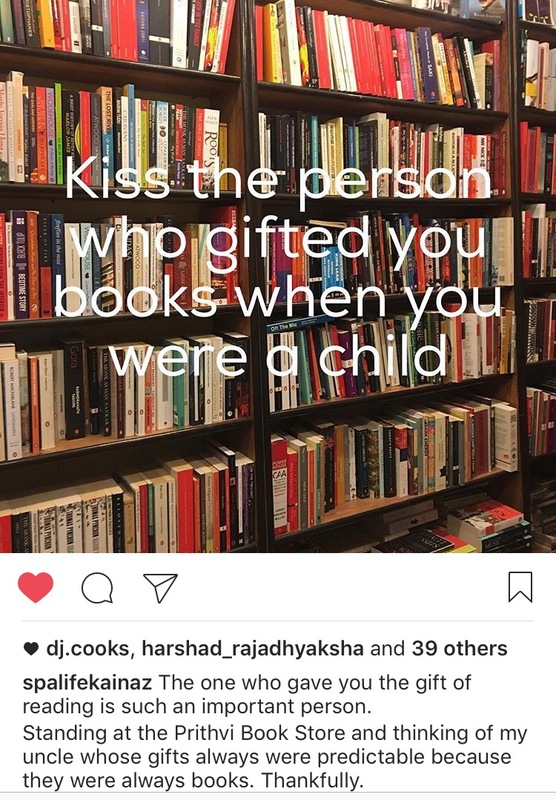 I used to love reading so much that my mother put up an embargo on me during exam weeks and books were not allowed at home. I used to smuggle story books in still, and if not caught, read them in the privacy of my room. I must confess that I have lost a bit of my love for reading of late. I don’t seem to have the patience to go through a book these days. I would blame it on my low attention span. When I do read a book, I turn a few pages, and then go back to my phone and click to see what’s happening. Links on the internet are what I read he most and then Travelogues and occasionally Buddhist books. I am trying to change that of late. Reading is the best way to open one's mind after all and to improve as a writer too. Standing at the Prithvi Book Shop, I resolved to consciously make an effort to read more. I have finished a magical reality book recently and am in the middle of Jerry Pinto's Murder in Mahim now. I am sure I can get back to it again. It might take some work but I will give it a shot. Just as I am doing with ‘conscious’ eating. After years of having a meal while watching TV or reading a book, I am trying not to do either while having my lunch. Focusing on my food instead just as they teach us in yoga class. It’s tough to eat and not do anything else, but I am not giving up. After having discovered the Prithvi Book Shop, I now know where to come to buy my books. How were the parathas you ask? That’s a story for another day as they eluded us this time. No parathas were eaten in the making of this post as they say. We tried our luck going the Prithvi Café after waiting for an hour at the bookshop. The promised 'fifteen minutes' had stretched on evidently. We were finally told at the chaotic reservation stand that we had a ‘table’. We walked through the maze of people sitting there. They seemed to be primarily students, thanks to the economic prices of the food here, than theatre goers said Vernika. I noticed people having pizzas, waffles and then at one table, parathas which smelt great. We were pointed to a corner where people were sitting. “You share tables here,” explained Vernika. Some young folks got up to make way for us and the three of us squeezed in like one would in a college canteen. It was 8 pm and we were famished. I opened the menu and ordered. “One cheese chili paratha,” I said excitedly. 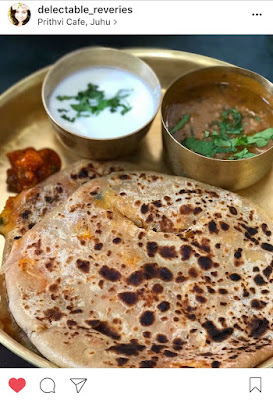 “Plain masala paratha with chhole for me,” said K.
“Sure, cancel the cheese and make it one masala paratha and one alu,” I said. “The mixed paratha is better than the alu (potato) here and I would recommend that,” said Vernika. “OK, whatever the ladies are saying,” I told our waiter and then thought of ordering an Irish coffee for old times sake. Vernika ordered for a masala chai and K a Coke Zero. The Irish Coffee was priced at Rs 130 so I doubt if it had any whiskey in it. I wonder if it did earlier. Do any of you know more about this as I don't remember? I was in a happy place. We had found a great book shop. Parathas were on the way or so I thought. Good books had been bought. La dolce vita as they say. “Parathas will take 40 minutes sir,” said the waiter with a smile cutting into my dreamy state. “The chefs told us that only one tava is working and there are a lot of orders,” said the waiter. “No,” he replied firmly with a smile like George in Peppa Pig when asked to share his chocolates. I was hungry and felt almost as murderous as Roose Bolton (GOT) on a bad day. We got up, left and went to Cafe Moshe’s next door, subjected ourselves to hummus and over heated and chewy pita (that was what they could get us the fastest) and then ran back to Bandra where my mom in law and Banu had kept dhansak and kebabs ready for the two of us. Vernika went home where her mother had made alu tikkas for her. Finally it all came down to good home cooked food to save the day. Vernika’s words of advice to us when was we left were, "come over one morning to Prithvi to have the parathas. That's when it is not crowded." I do plan to come back to the Prithvi Book Shop for more books. This time, however, I will have the excellent parathas at Lassi te Parrothe or at Lashkara in Bandra, or our cook Banu’s alu parathas at home, before heading out to Prithvi! Even the lure of Padma Lakshmi making the parathas herself at Prithvi Cafe would not change my mind. Nor the promise of Nigella Lawson doing so and slipping in some bacon bits in the process. That's how deeply I was scarred by the experience. Some things should best remain as urban legends I guess. The bookshop accepts cards as well as cash. 1. Link to where you can buy my book, The Travelling Belly, on Amazon.